Arrived here safe and sound and Allison & Eric (two of the 4 children) got here a couple hours later followed by Bert (#3 child) and we all had a great time catching up. Have taken some pictures of the wonderful food and also, a few people pictures – everyone is fine here. Bert, Roy & Eric – doing what we did ALL weekend. 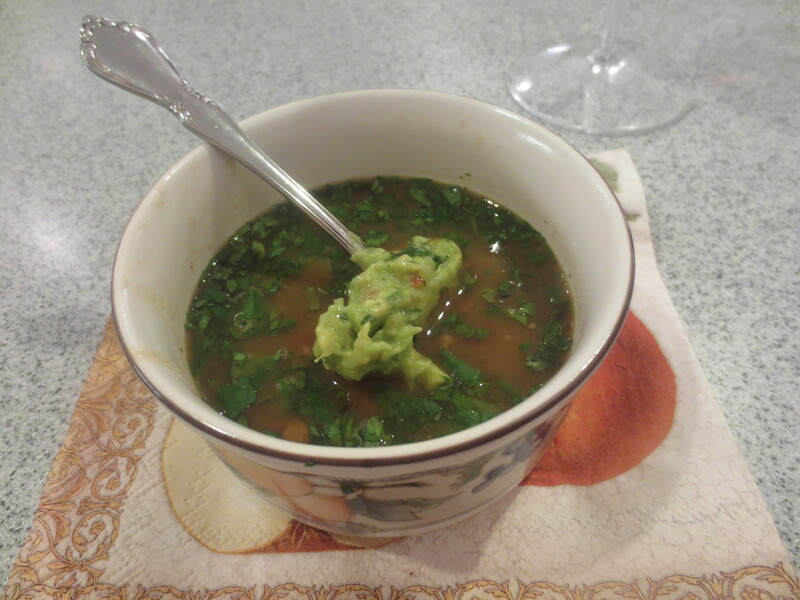 Food started being put out almost immediately – baked Chicken Wings, Mexican style with Blue Cheese and Guacamole; followed by Charro Bean Soup with a dollop of Bill’s Guacamole. Next course: King Ranch Casserole and finishing with a slice of Sour Cherry Pie with Blue Bell ice cream. Burp! 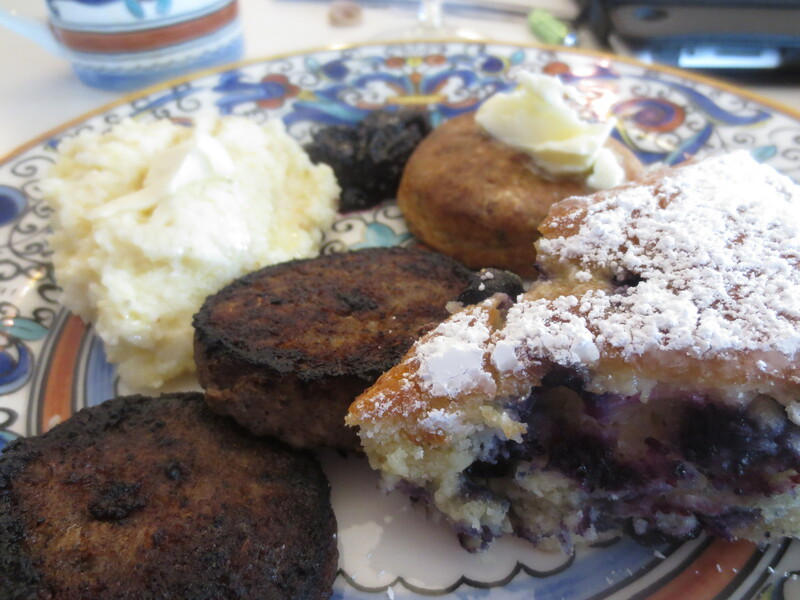 Grits, Sage Sausage, Cheddar Thyme biscuits and a Blueberry ‘coffee’ cake. Of course, everything with very tasty. I don’t think we were home long before Jane & Bill did more magic in their kitchen – today in addition to their skills, daughter Allison performed her magic with a Tasting board. 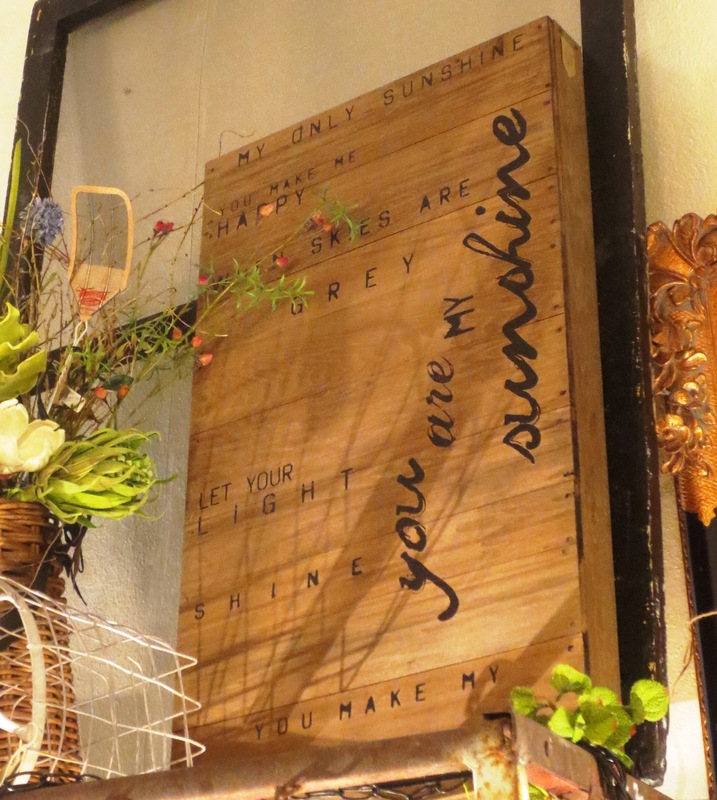 She is working on tastes for a show coming up featuring products carried in her store (H.E.B. ), where she is the Deli Mgr. and our Cheese Monger extraordinaire. She made a beautiful presentation and wouldn’t you know when I tried to look at the pictures I took, the camera card was still in the laptop – no pictures of what she had worked so cleverly on. 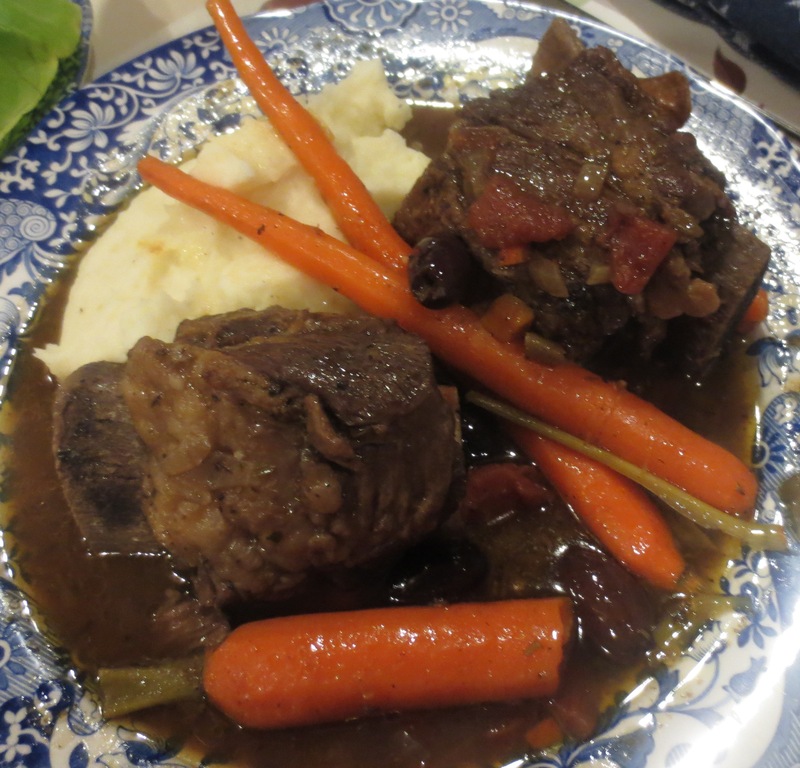 Dinner was Braised Short Ribs with Carrots and Olives, Crème Fraiche mashed potatoes, rib jus drizzled over. A butter lettuce salad with blue cheese, walnuts and a Champagne vinaigrette. 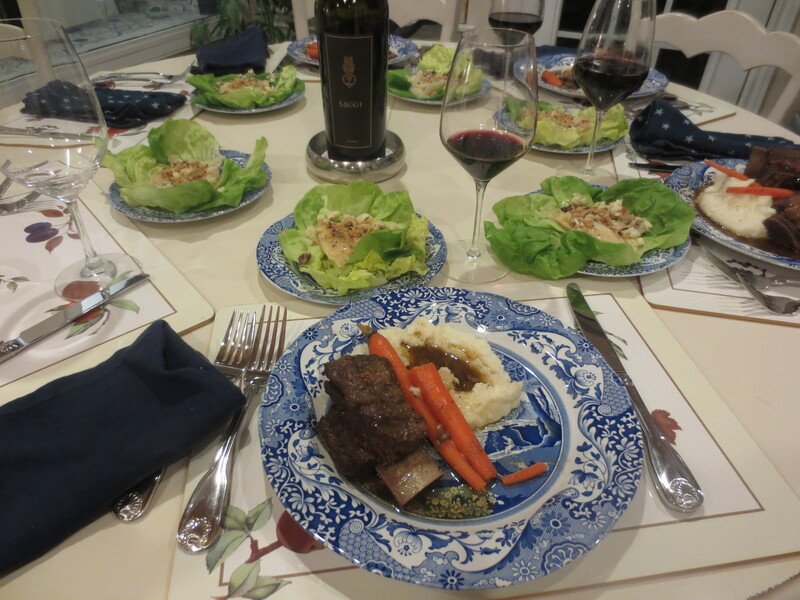 Jane made this salad Jan. 24, 2015 while we visited – served with Braised Short Ribs and Crème Fraiche mashed potatoes. Whisk together the first 5 ingred. Gradually whisk in the walnut oil. And then, there was Allison’s (Bill & Jane’s ‘girl child’) plate which was larger than she! 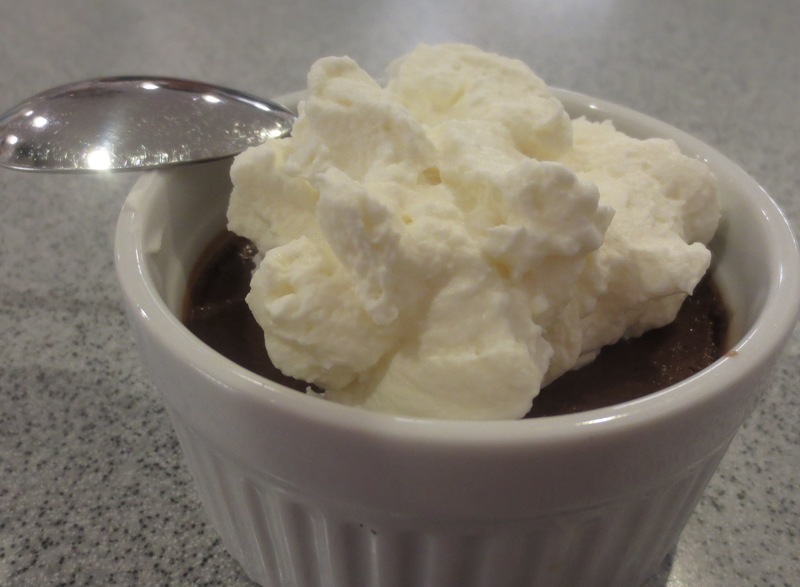 By this time we were ready to crawl from the table, but Jane had a different idea for us… Pots de Crème with White Chocolate Whipped Cream. To walk all this off in anticipation of the next culinary extravaganza, we headed to the fairgrounds where their son, Bert, was judging a Brisket Cook Off – Bloody Marys and Chili cook offs had been held that morning and the day before. I have never in my life seen so many “good ole boys” in one place in my life. I would have loved to have taken all of their pictures, but I was afraid they might think I was making fun. 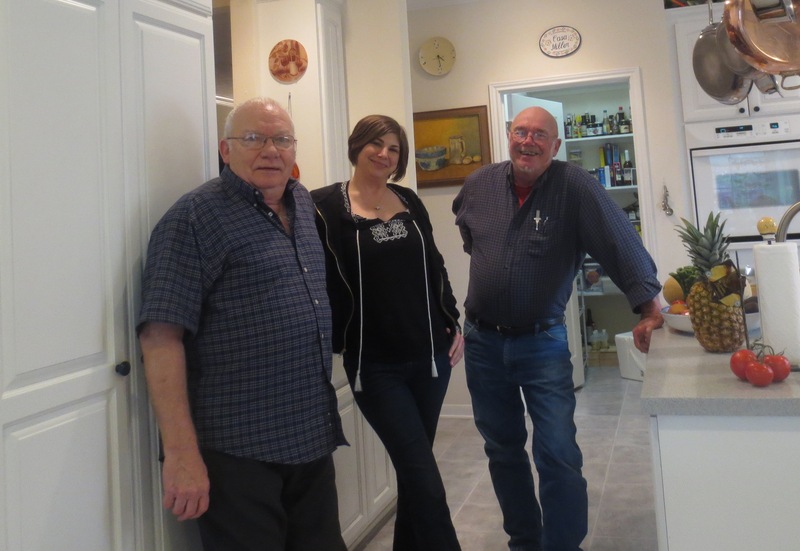 The whiskers, bow legs and cowboy gear – clean and sparkling plus the grubbiest ever (the folks who had been cooking all weekend) – everything was just a hoot! Wish we could have tasted some of the brisket. 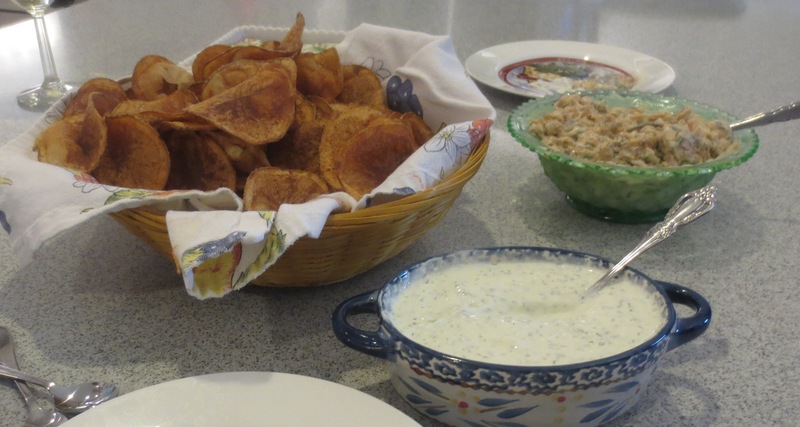 1st course – homemade potato chips, Feta & Dill dip and Three Onion Dip (this one I couldn’t stop eating). Note: Jane passed along her modifications: 2 tsps. Worcestershire sauce plus she uses 3 anchovies. 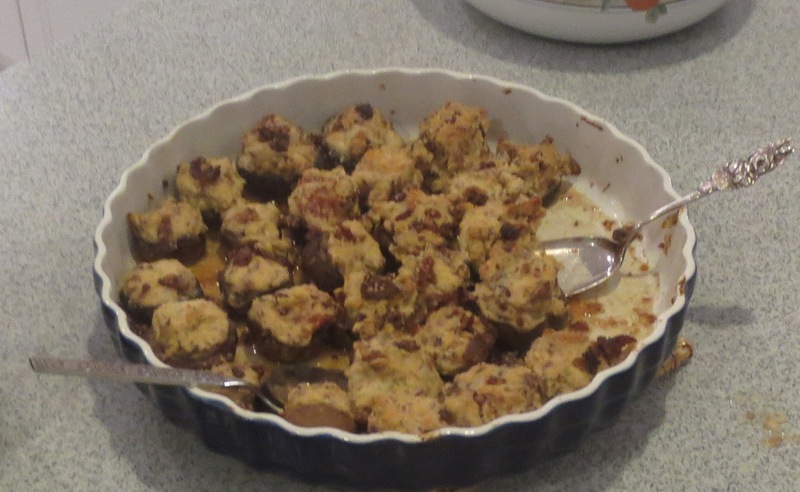 Stuffed Mushrooms – so tasty. 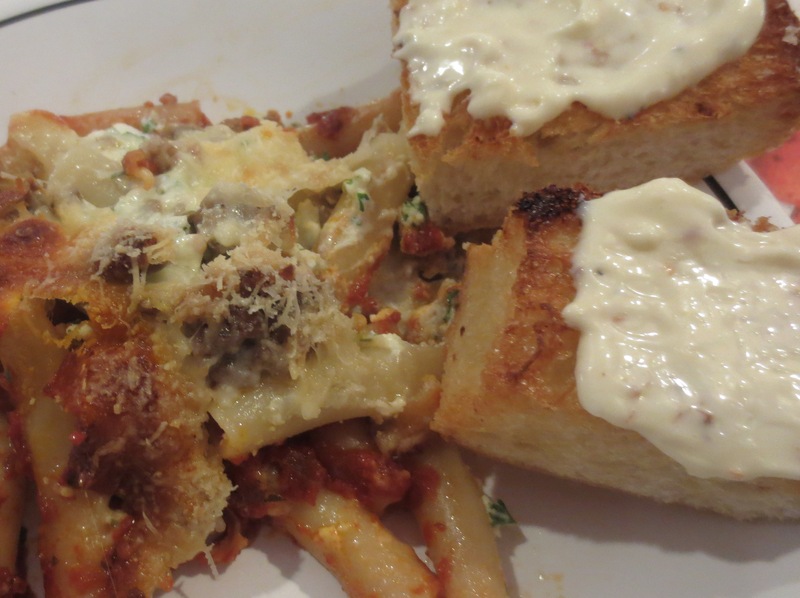 And then, the entrée – a robust, rustic Sausage Ziti Casserole which was also so good with just the right amount of heat and seasoning to entice a body to overeat again. New friends treated us to a wonderful Paella dinner last evening – Gary & Guimi entertained us royally with a Shellfish/Chicken/Sausage/kitchen sink dish cooked in their gazebo while the rest of us relaxed with good wine and ‘hearty’ Bloody Marys. Finished the evening with a rum cake and port. Happy campers all! Our thanks to them for a wonderful evening – the first of many get togethers, I’m sure. It should not surprise anyone that I came away with a recipe! Guimi makes the tastiest Butter Rouille which we all were ‘slathering with abandonment’ (like that? J ) on our bread rounds. A perfect match for the Paella! That ended the gluttony of the weekend and Monday morning saw us all groaning when Miss Jan listed off what she’d like to make for us for Breakfast. We ended up with a slice of Sour Cherry pie with our coffee and then headed to our ‘temporary’ home in Sulphur, Louisiana. 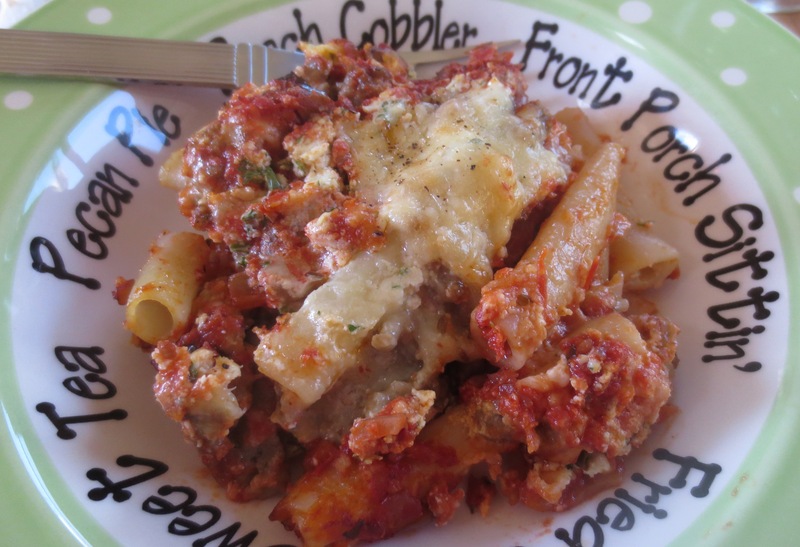 Monday’s dinner was a quick one as Jane sent us on our way with leftover Ziti casserole. She also sent home a couple of leftover short ribs which will top a Cracker pizza Tuesday. And then it is diet food time for a while. If you are ever near Navasota, Texas – drop in on the Miller’s, I’m sure they will feed you just as well as they do us every time we visit!! Thanks for another wonderful visit, Bill & Jane. My poor blog has been ignored for quite a while. We’re staying put in Louisiana until we have better weather to head up the east coast to see old friends and meet new. 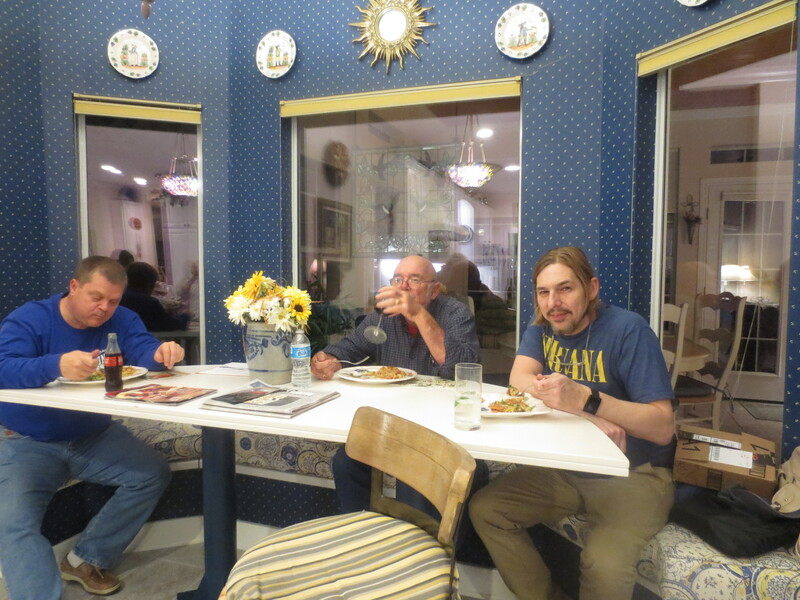 So, we’ve kind of hunkered down in the little town of Sulphur, a suburb of Lake Charles and I’ve done more cooking than sightseeing the last few weeks. 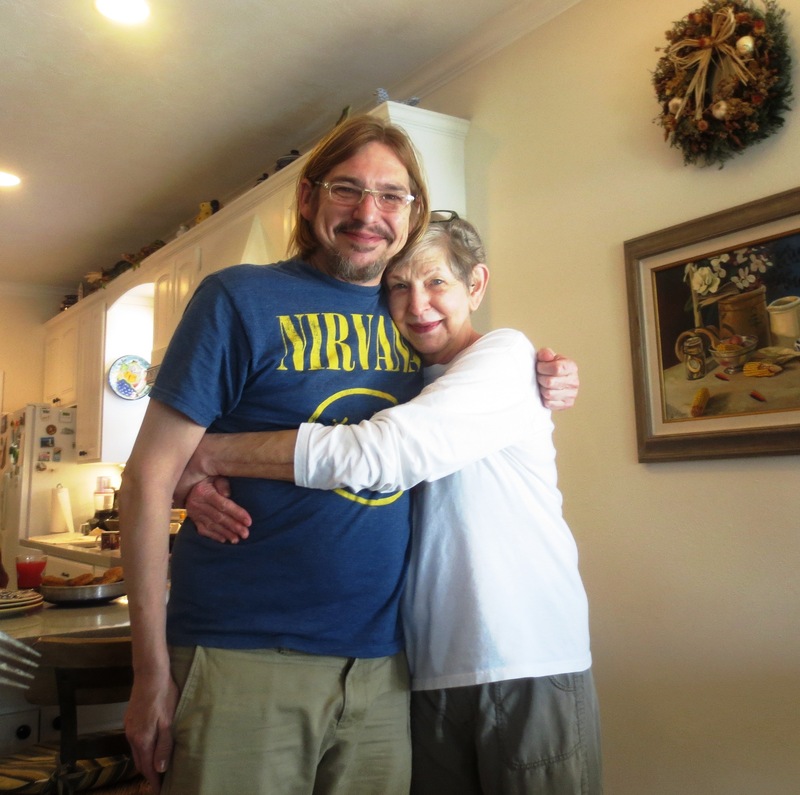 Plus spent the holidays here cementing friendships with some of the locals – great people in this area. 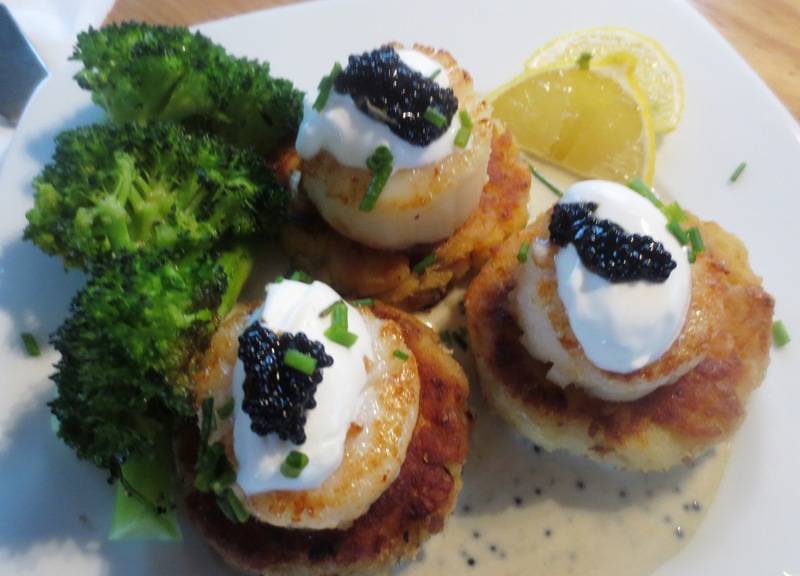 Since I can’t tell you more about the area, here are some of the dishes I’ve been cooking and maybe one will spark interest in you to add to your menu. A great find last month was an ebook, “The Southern Foodie – 100 Places to Eat in the South Before You Die,” and to find it while we are spending a few months right in the middle of all this wonderful Southern food! First dish I tried was a winner (and that’s always a very good sign) – Lasyone’s Red beans and rice and Sausage. The Lasyone family has owned and operated this restaurant in Natchitoches since 1967. 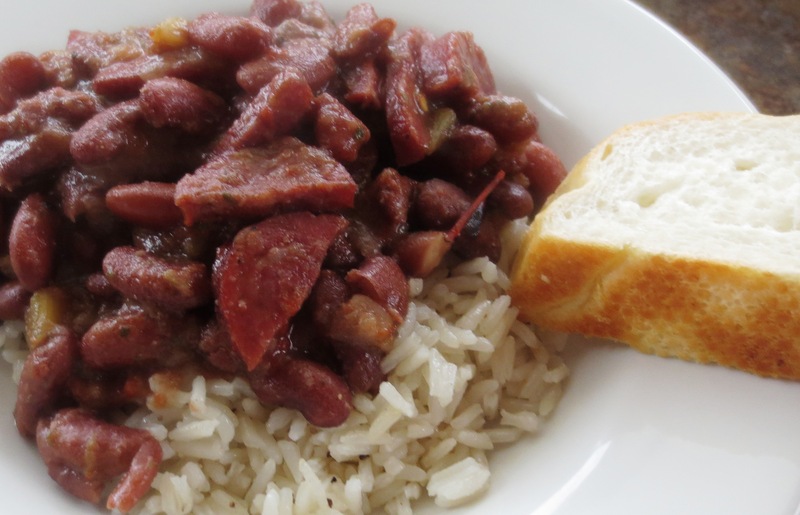 Highlighted offerings which the restaurant is known for – Fried Meat Pies, Crawfish Pie and their Red Beans, Rice and Sausage, which I made and thoroughly enjoyed heat from the seasoning and also the spicy smoked sausage I bought locally and used. In large pot combine the lard, water, beans, onion, bell pepper, and celery. Cook uncovered on medium heat, stirring occasionally and adding more water as needed, for 1 1/2 to 2 hours, until the beans are tender. Add sausage, garlic powder, red pepper, parsley, sugar, and salt during the last 30 minutes of cooking. Serve over the rice. 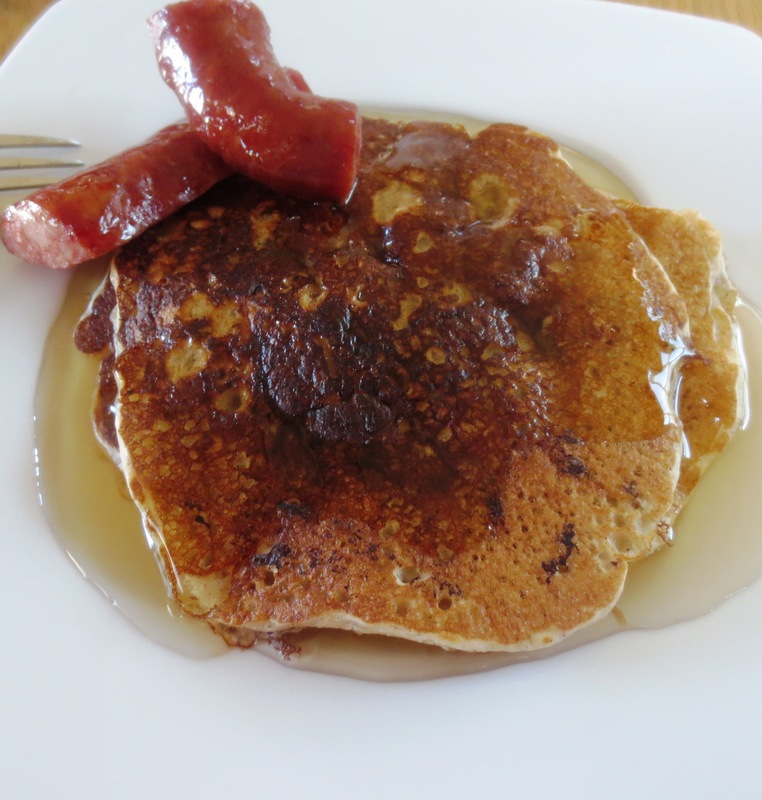 A new breakfast treat for us was making Apple-Walnut Pancakes one Sunday morning. The recipe comes from Cooking.com and the pancakes are wonderfully light and flavorful from the tart apple and toasted walnuts. Treat yourself to a short or tall stack of these fluffy pancakes flecked with tart apple and toasted walnuts. Eat them as is, or smear them with sweet butter and a drizzle of warm maple syrup. Combine the flour, sugar, baking powder, cinnamon, baking soda and salt in a medium bowl. Whisk together the buttermilk, egg and butter in a small bowl. Add the buttermilk mixture to the flour mixture stirring just until the flour mixture is moistened. Gently fold in the apple and walnuts. Brush a nonstick griddle or large nonstick skillet with oil or spray with nonstick spray and set over medium-low heat. Using a scant 1/4 cup for each pancake, pour the batter onto the griddle. Cook until bubbles begin to appear and the edges of the pancakes are dry, about 2 minutes. Turn the pancakes over and cook until lightly browned, 1 to 2 minutes longer. Transfer the pancakes to a plate and keep warm. Repeat with the remaining batter, making a total of 12 pancakes. Tip: If the batter is a little too thick, thin it out by gently adding more buttermilk, a tablespoon at a time. Alternately, if the batter is too thin, add a tablespoon or two of more flour. 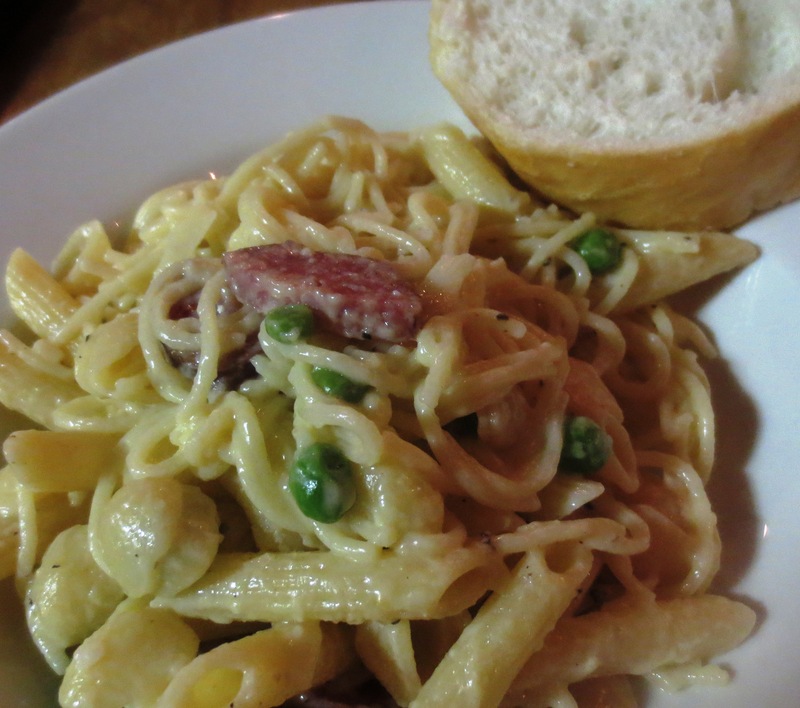 And, while we’re in the country of spicy smoked sausages, what better twist to try with a dish than making Salami (or Sausage) Carbonara – the creaminess combined with the spiciness is just brilliant. The recipe calls for Salami, but we loved the sausage addition. In a large, deep skillet, heat 2 tablespoons of the olive oil. Add the salami and cook over moderately low heat, stirring occasionally, until the fat is rendered and the salami is tender, about 20 minutes. Meanwhile, in a large pot of salted boiling water, cook the pasta until al dente. Drain, reserving 1 1/2 cups of the cooking water. In a medium bowl, whisk the egg yolks with the 1/2 cup of cheese and the remaining 2 tablespoons of olive oil. Add the pasta and 1/2 cup of the reserved pasta water to the salami and cook over moderate heat, tossing, until the pasta is coated and hot, about 2 minutes. Remove the skillet from the heat and immediately add the egg mixture and remaining 1 cup of cooking water. Using tongs, toss the pasta until creamy, about 1 minute. Season with salt and black pepper. Serve in shallow bowls, passing more cheese at the table. 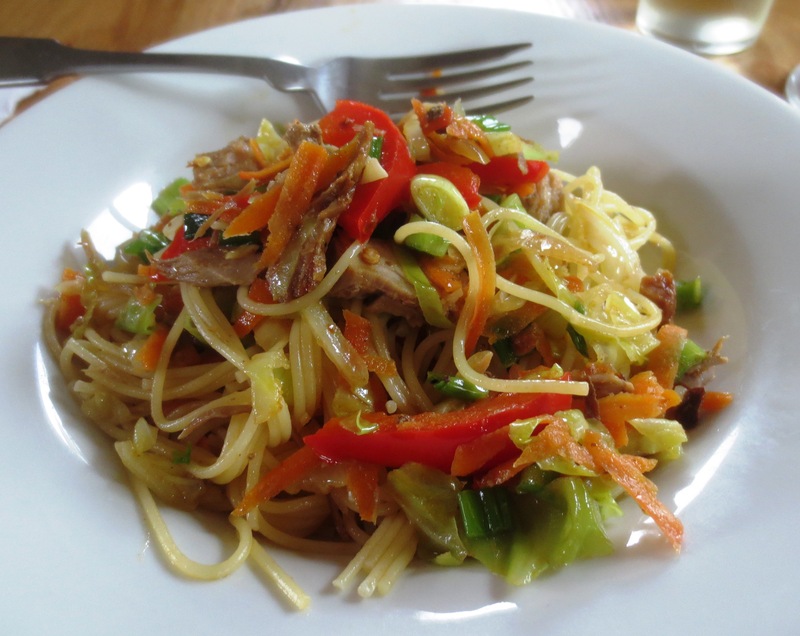 Substitute just about any meat or fish for the pork and you’ll have a delicious and fast dinner. Prepare pasta according to package directions; drain and toss with 1/2 Tablespoon of the sesame oil, set aside and keep warm. Dice the pork and set aside. I’m going to finish up this blog entry with an old favorite which is an invaluable recipe to have in any cook’s repertoire – how to make Crème Fraîche – which is a thickened cream with a tangy, nutty flavor. It can be very expensive to buy in the U.S. which seems quite frivolous given the flavor is substandard to that made in France. 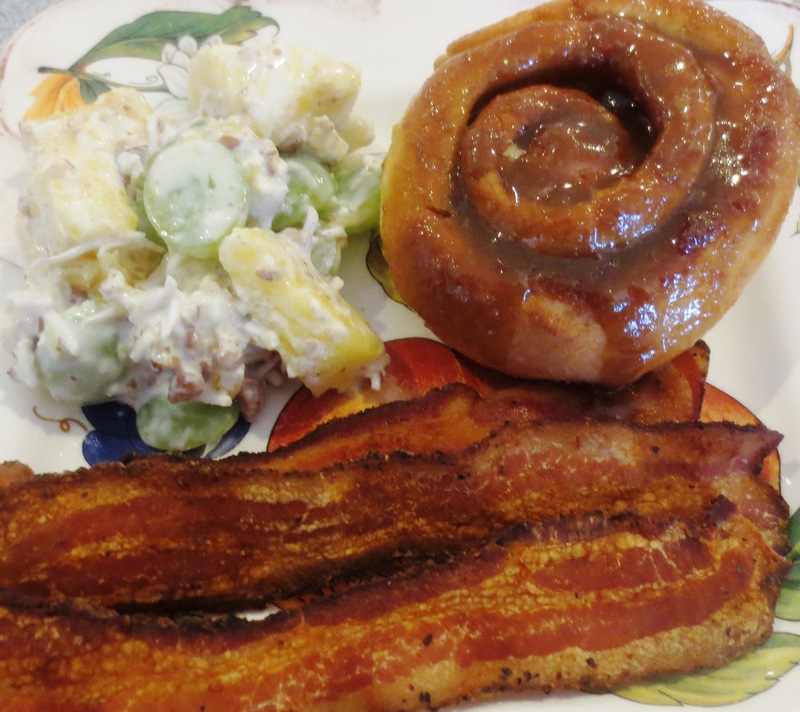 Homemade is equally delicious and so very easy to make at home. My friend, Chef June Jacobs gave me this method years ago and I love having it on hand. Warm cream in heavy small saucepan to lukewarm (85° F). Remove from heat and mix in buttermilk. Put the mixture into a clean glass jar (that has a tight-fitting lid for later use). Leave the jar open and cover with a piece of waxed paper or parchment paper, fastened with a rubber band. Let it stand in a warm draft-free area until slightly thickened, 24 to 48 hours, depending on temperature of room. When the cream has “clotted,” remove the paper and replace it with the lid. Refrigerate until ready to use. That’s it! It is so easy and so very delicious. Chef June’s tip: Stored in this manner, the Crème Fraîche should keep until you’ve used it up (and made more!) Like fine cheese, it may develop a “skin”, but you can remove it and use what’s underneath. Another of her tips – Crème Fraîche whips beautifully and is wonderful on a strawberry shortcake. Note: Normally all I can find is ultra-pasteurized and buttermilk on the shelves is reduced fat/1 ½% milkfat/50% less fat than whole milk, but it works. Mine is normally ‘clotted’ after 30 hours. Well, it’s time to check out the freezer – it’s almost empty and figure out how much I can buy at the Holly Beach Seafood Shack here in town. They have been closed since mid-December, so I’m really anxious to check out what they have for us this new year. Hope you find something in the above recipes you might like to try – let me know if you do. Would love to hear.